1. What does TSKgel stand for? The original name of Tosoh Corporation, the parent company of Tosoh Bioscience, was Toyo Soda Manufacturing Co., Ltd. TSK is short for Toyo Soda Kogyo (manufacturing in Japanese). The word “gel” is the generic term for the resin used in our columns. TSKgel is a registered trademark of Tosoh Corporation. 2. What is the significance of “-5PW” when referring to TSKgel columns? Polymeric based Size Exclusion Columns supplied by Tosoh Bioscience start with a base support material. One of these supports is methacrylate derivative with a pore size of 1000 Angstroms. This is the same resin used in the TSKgel G5000PWxl columns. So when this resin is functionalized with a ligand such as sulfo propyl the product is called SP (for sulfo propyl) -5PW (for the G5000PWxl support matrix). 3. What kind of fittings and connectors will I need in order to use TSKgel HPLC columns? The choice of fittings is dictated by the type of housing containing the packed resin. For stainless steel the columns have 10/32 female inlets and outlets. This is the universal standard for this type of column and we recommend “fingertight” style plastic fittings with PEEK tubing (always 1/16” OD) throughout your chromatography circuit. The same applies to TSKgel columns made from PEEK, i.e. 10/32 fittings. 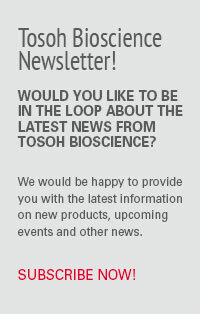 Tosoh Bioscience also supplies glass chromatography columns packed with various resins. These columns employ ¼-28 female threads both in and out of the column. ¼-28 fittings are typically used with 1/8” OD Teflon tubing for low pressure FPLC applications. 4. Is it always necessary to use a guard column with a TSKgel analytical column? A guard column is generally recommended because it protects the analytical column from a major contamination of the HPLC, e.g. pump seal failure. It also protects against inadvertent overloading of the column because a guard column is both a particulate AND molecular filter. However, if the mobile phase and sample are filtered to 0.22- 0.45 micron a guard column may not be necessary. The user still, however, exposes the column to the potential contamination from the HPLC system. 5. What quality control procedures are used by Tosoh Bioscience to assure column performance? Tosoh Bioscience strives to attain the highest possible consistency and quality of performance for its columns and resins. The support resin, e.g. silica, is tested thoroughly for both physical and chemical characteristics. Once a ligand is attached to the base matrix the material is tested again according to stringent QC methods. Finally, after the resin is packed the individual column is tested with an analyte. This analysis is sent with the column on a sheet called “Inspection Data”. EVERY TSKgel COLUMN IS TESTED INDIVIDUALLY BEFORE RELEASE FOR SALE AND THE INSPECTION DATA SHEET IS PROVIDED FOR FUTURE REFERENCE. 6. Please explain the lot numbering system used for TSKgel columns. the column serial number which is unique to that specific column. The lot number refers to a production run of packing materials. Occasionally resin lots have a small amount of material remaining in which case 2 or more of these small amounts are combined to make a “mixed” lot designated by the letter “M”, e.g. -10HM.